It’s Wednesday (otherwise known as hump day) it’s means two things: 1. You’re midway through the week and want to celebrate a little and 2. You’re probably a bit tired. So, we’re going with a simple scramble for this week’s Williams Sonoma Wednesday. Like some of the best Spanish dishes, this revuelto (“scramble”) is almost embarrassingly simple, but it shines when prepared with the best possible ingredients—such as fresh farm eggs. 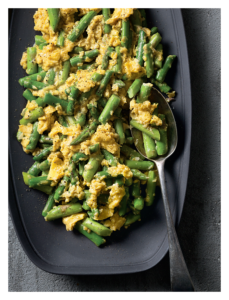 Take it easy tonight and enjoy this simple, scrambled eggs with asparagus from Williams Sonoma’s Rustic Spanish! Separate the asparagus stalks from the tips and cut the stalks into 1-inch (2.5-cm) pieces. In a heavy omelet pan or sauté pan, bring to a boil a little salted water and simmer the asparagus stalk pieces for 3 minutes. Then add the tips and simmer for another minute. Drain and set aside. Pat the same pan dry and place over low heat, then add the olive oil. Beat the eggs with a fork and season them with salt and pepper. Stir-fry the parcooked asparagus for a few seconds, add the garlic, and sauté briefly until lightly colored. Pour in the beaten egg and allow to cook for 20 seconds. Drag a wooden spoon through the egg and asparagus mixture a few times until the egg is just cooked and the revuelto has a creamy (not dry) texture. Turn off the heat and turn out into a serving dish. COOK’S NOTE: If you can find it, the most ideal asparagus for this dish is the slender and slightly bitter wild kind (also called “sprue”). 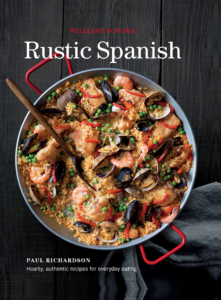 For more delicious & accessible Spanish recipes, order your copy of Rustic Spanish today!